What is a Corneal Topographer? A corneal topographer is an integral part of our screening process for LASIK and PRK laser eye surgery at Mandel Vision. The topographer measures the curvature of the cornea, the front surface of the eye and compares it to a perfect sphere. It then creates a color topographical map of this surface. 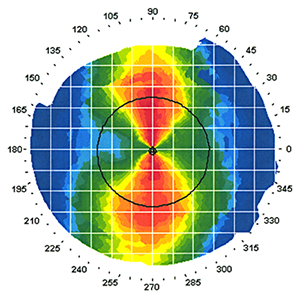 This map highlights the curvature of the cornea and quantifies astigmatism present in the cornea. From the patient’s perspective, it’s as simple as having a picture taken of the eye. One of our skilled technicians will assist you so that your chin and forehead are properly situated. You will be then asked to stare at a red light for a few seconds as the picture is taken. The technician will center your eye and begin the measurement process. When signaled by the technician, the topographer will project concentric rings of light onto your cornea, one eye at a time. The reflected image from these rings is captured by a camera. This image is analyzed by sophisticated computer software and compared to what is considered normal corneal parameters. The data is then displayed in various topographical maps of your cornea. These maps are then carefully analyzed by Dr. Mandel in conjunction with all of your diagnostic tests to determine your candidacy for either LASIK or PRK laser eye surgery. 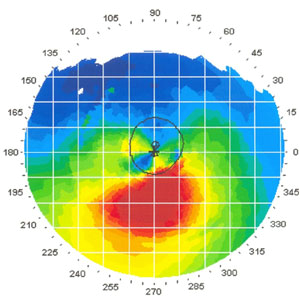 Why is Corneal Curvature Important? It maps corneal astigmatism which both quantifies and illustrates the orientation of the astigmatism. It can uncover underlying corneal disease which can disqualify you from both LASIK and PRK laser eye surgery.